At SIGGRAPH91, graphics researcher and digital artist Loren Carpenter stood near the front of an 5000 seat auditorium in a Las Vegas hotel. 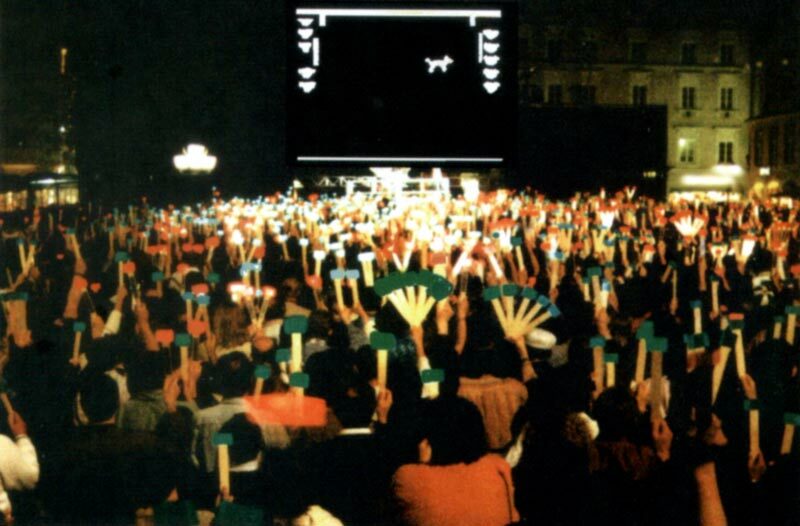 In the seats in front of him, the attendees held cardboard paddles, one side of which was red, the other green. Behind him was a giant screen covered in blinking and shifting red and green dots. After a few moments, the audience figured out what Loren already knew. A camera was trained on the auditorium and was feeding images into a computer that then displayed the color and polishing of every paddle in the room. The audience cheered and began to wave back and forth in unison. The ball began to move across the screen and the paddles twitched to life. The paddles move to a height calculated from the relative number of red and green paddles. If everyone shows the same color, then the paddle will move to either the extreme top or the extreme bottom. However, if some show the opposite color, then paddle will stop somewhere in the middle. Surprisingly quickly, the crowd began to play effectively, even when the speed of the ball increased. This entry was posted in animation / interactive / film, installation / sculpture, tech and tagged emergentbehavior, lorencarpenter, pong, video, videogames, wisdomofcrowds on November 3, 2013 by jonathan. 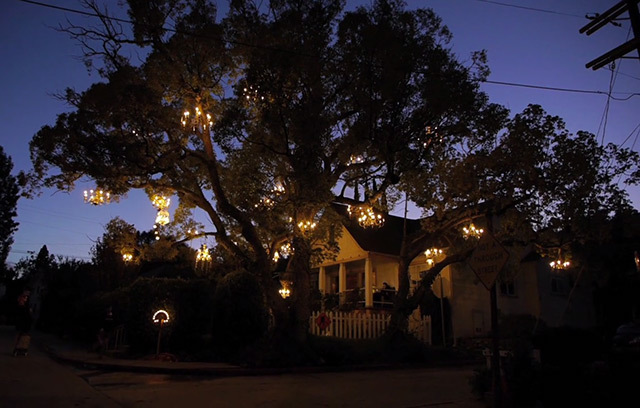 For the past six years at the corner of West Silver Lake Drive and Shadowlawn Avenue in Los Angeles Adam Tenenbaum has been hanging and lighting chandeliers from a large tree in his front yard. With about 30 chandeliers in the tree now, it looks fantastic after dark. This entry was posted in installation / sculpture and tagged adamtenebaum, lamps, losangeles, video on July 13, 2013 by jonathan. The part of me that loves secret panels and unfolding compartments, but I can’t help but think that it’s a bit cumbersome. To get to some tools you have to move three panels just to reach them. It’s more “art” than “tool”, but that does not diminish craftsmanship or beauty of the piece. 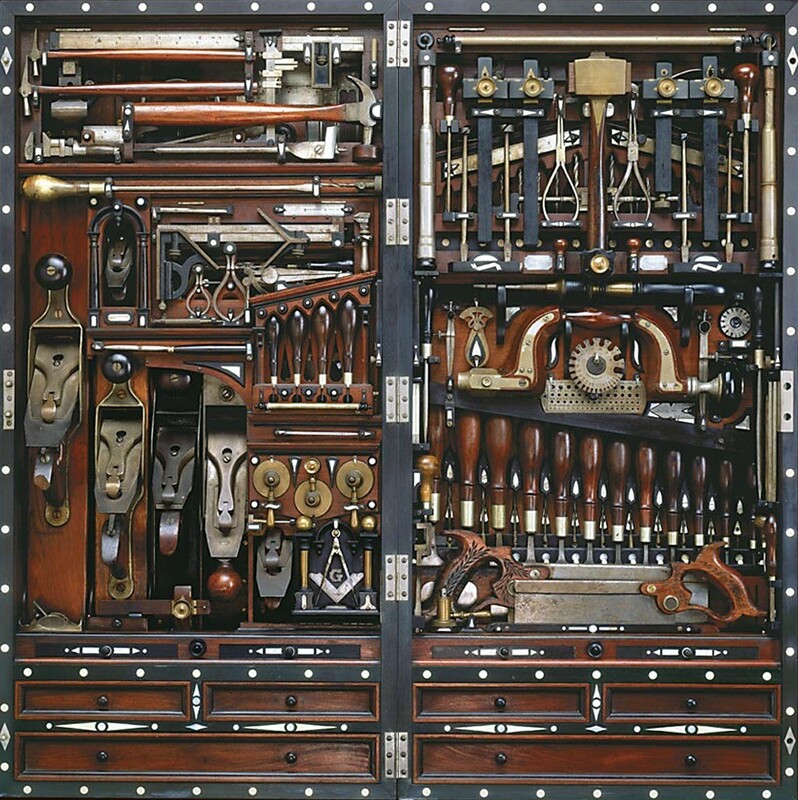 This entry was posted in architecture / furniture and tagged henryostudley, toolchests, video, woodworking on July 3, 2013 by jonathan. Just when I thought 70s Hanna-Barbera couldn’t get more derivative, they came out with an animated spinoff of a crappy tv show with the entire style recycled from their crappy retread of a crappy animated knock off of a successful tv show. 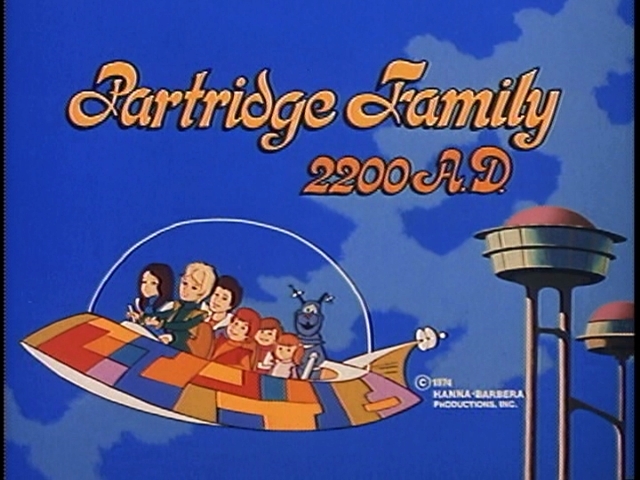 Of course something as synergistic as the Partridge Family 2200 AD doesn’t come from just one boardroom. The story is that Hanna-Barbera was developing a spin-off of The Jetsons where Elroy would be a teenager, and I guess Judy would be a sorority girl at Universe University or some such nonsense. Anyway, when HB was shopping this idea to CBS, the CBS execu-bots, said they’d take it, but only if they added more Danny Bonaduce. So a few superficial changes later, and whoala! I stand by my long held belief that the 1970s was the worst cultural decade in American history. This entry was posted in animation / interactive / film and tagged animation, cartoons, flintstones, hannababera, honeymooners, jetsons, partridgefamily, synergy, television, video on May 10, 2013 by jonathan. This entry was posted in tech and tagged drones, grasplab, killbots, quadrocopters, robots, upenn, video on April 23, 2013 by jonathan. 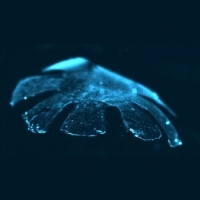 Janna Narwoth, advised by Kit Parker at Harvard, created a jellyfish mimic from the cardiac muscle cells of a rat. (Video after the jump.) Copying the structure of Moon Jellies, the cardiac muscle cells were grown so that they were aligned into ring shape on a sheet of polydimethylsiloxane. When electricity is applied, the muscle cells contract, deforming the ring into a bell shape. When the electricity us removed, the cells relax, and the natural elastic properties of the substrate reflatten the disk. Examining the fluid dynamics, the mock jelly not only propels itself, but also creates a counter vortex that drives particles up and into the center of the bell, just like real jellyfish. The researchers hope to apply this technology as a tested for examining the effectiveness of certain cardiac drugs. This entry was posted in installation / sculpture, tech and tagged artificiallife, biology, biotech, geneticengineering, jannawroth, jellyfish, kitparker, video on December 30, 2012 by jonathan. Sold by weight. Not volume. This entry was posted in tech and tagged death, robots, video on July 13, 2012 by jonathan.